← Parma Number 43: The Stock Exchange Hotel … sometimes the easiest things are the most difficult to get right! The Verdict: In the aftermath of a fairly ordinary day on the punt (an 80-1 winner of the Melbourne Cup was not what I expected) I was looking for a chicken parmigiana of quality to little my floundered spirits. Whilst I enjoyed some elements of the Crown Hotel chicken parmigiana, indeed some elements were quite good, the shredded ham and the microscopic size of the chicken piece were downers that only served to elongate my post Melbourne Cup malaise. Chicken Piece: The chicken piece in the Crown Hotel chicken parmigiana was well crumbed and had been cooked perfectly. The principal, in fact the only, problem with the chicken piece was that it was quite small. Tomato Sauce: I really enjoyed the tomato sauce on this dish. It was the hero of this dish: it both covered the chicken piece very well and tasted great. Ham: I continue to fail to understand the allure of shredded ham out of a packet from Woolworths (or some other such supermarket) as an accompaniment to this meal? I couldn’t taste it: enough said. Cheese: Keeping with the theme of this dish, being a mix of great and ordinary elements, the cheese on the Crown Hotel Parma was quite good. It was well melted and covered the chicken piece well. Side Dishes: The salad was excellent. It was fresh and had been well dressed. The chips were well cooked and well salted but the portion was actually quite small. Indeed it was small enough to almost be fully covered by the small chicken piece. Presentation: This was a small meal, as I have mentioned before, and, despite that, the meal was still presented with the chicken piece on top of the chips. The Venue: The Crown Hotel is Lutwyche in Brisbane’s inner north. It is an old school put with a large TAB area and bistro. My parma was $19.50. The Final Word: There were a lot of really good elements to this chicken parmigiana however, getting past the shredded ham, its striking feature was that it was just a bit small for my liking. 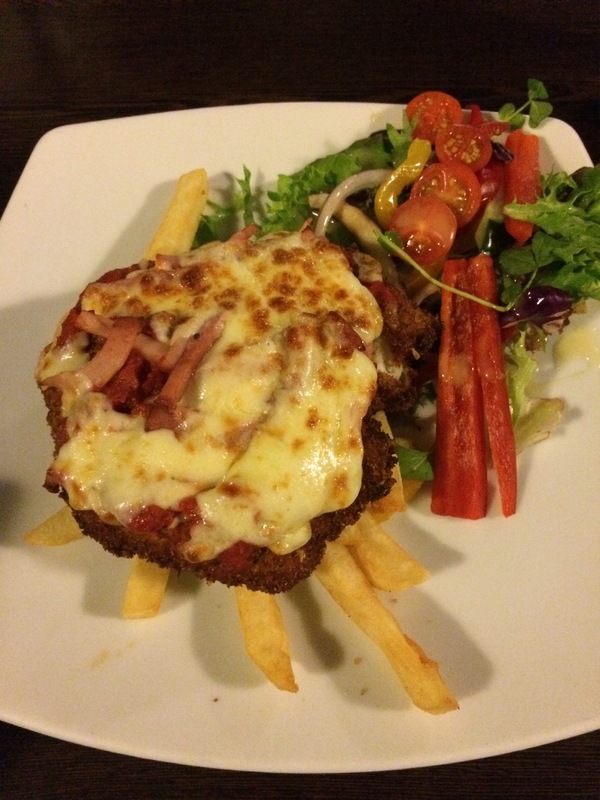 This entry was posted in Uncategorized and tagged Brisbane, brisbane eats, brisbane's best parma, chicken, chicken parmigiana, crown hotel, food. Bookmark the permalink.